GoPro applies HEVC support to HERO6 Black making a reality to shoot 4K 60 fps footage and 120/240 fps slow motion. Superior to H.264, HEVC features equal image quality at 50% bit rate for higher data compression ratio. Through HEVC, users can record a GoPro video with smoother appearance but smaller size. However, HEVC doesn't win a so wide compatibility as H.264 and requires newer system/hardware. Sometimes, in order to earn better playback or editing, you have to convert GoPro HEVC videos to H.264. • Convert GoPro 4K HEVC videos to H.264 or other popular format like MPEG-4, AVI, WMV, MOV, FLV etc, for almost all devices, websites and video players/editors with ease. • Support Hardware Acceleration (Intel/NIVIDIA/AMD) to bring much faster HEVC video encoding, decoding and processing. GoPro 4K HEVC can be quickly converted to H.264 while keeping a quality as great as original. 1. The computer or device is no available for HEVC. 2. The editor or player can't handle HEVC well. - I'm using a Hero 6 and an Intel i7 8700K on Win10. According to Quik overview, HEVC should run. Unfortunately, Quik does not show any videos in HEVC format. - GoPro Quik isn't able to playback any of my gopro hero 6 new record settings such as 4k 60, 2.7k 120 and 1080p 240 (can only see thumbnails or black screen, all other record settings work). I have a new 15' 2016 Mac pro, HIGH sierra installed and all updates. 3. GoPro App has some limitations to view HEVC videos on mobile. GoPro has listed some limitations of viewing HEVC videos on all iOS & Android devices. • No matter whether the device supports HEVC or not, GoPro App doesn't allow you to view the video while recording. In other words, live view is impossible. • No matter whether the device supports HEVC or not, GoPro App doesn't allow you to view a HEVC video stored on SD card. • 4K 4:3 playback is unavailable via GoPro App in Android. QuikStories offers an auto convert for playing successfully in iOS. 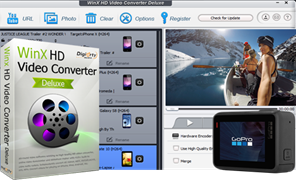 WinX HD Video Converter Deluxe, a versatile video processor, can work as a professional GoPro HEVC converter offering the easiest way to change the video format from HEVC to H.264. No matter what HEVC files you recorded on GoPro, 4K 60fps, 4K 4:3, 2.7K 120fps, 1080P 240fps, it can well accept and convert to H.264. Generally speaking, resolution, frame rate, aspect ratio will be kept as original. You are also allowed to adjust the parameters to make them better fit with your display. Besides H.264, it is capable of converting GoPro HEVC videos to AVI, WMV, MOV, FLV and more. Built-in hundreds of profiles, GoPro HEVC videos can be directly converted to iPhone, iPad, Android, Windows Mobile, Xbox, Sony PlayStation, Webs (YouTube, Facebook etc. ), Programs (iMovie, Final Cut Pro, iTunes) with perfectly pre-made settings. It boasts fast conversion speed with integration of Hardware Acceleration (Intel/NVIDIA/AMD). It uses GPUs to handle video encoding, decoding and processing while freeing up CPU for other tasks. Besides highly efficient performance, you can also enjoy an output file with super great quality (almost close to original). Download and install this GoPro video converter on your computer. Then, follow the steps to transcode GoPro HEVC/H.265 videos to H.264. Step 1. Launch WinX HD Video Converter Deluxe and Click Video button to access Video Converter window. Click +Video to import a single GoPro HEVC video or multiple videos. Step 2. Move to the bottom of the interface. Click Video tab and select MP4 H264 as output format. Also, you can choose iPhone H264 or Android H264 if you want to play GoPro HEVC video on your device. 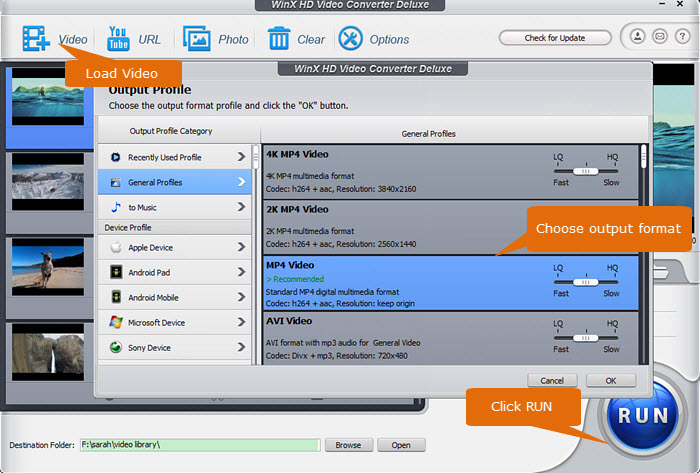 Tip: WinX HD Video Converter Deluxe offers hundreds of output profiles including general videos, devices, webs, DVD and more. If you would like to convert GoPro HEVC/H.265 videos to other formats, click Target Format to access to more output options. Step 3. Click Browse button to define a new destination folder if necessary. And, click RUN button to start GoPro HEVC to H.264 converting. WinX HD Video Converter Deluxe will automatically enable hardware acceleration (Intel/NVIDIA/AMD) according to your graphic cards helping deliver a very fast conversion performance. It Is Worth Installing WinX HD Video Converter Deluxe to Process GoPro Videos. • Besides transcoding GoPro HEVC/H.264 videos, it can also compress GoPro 4K videos to 1440P, 1080P, 720P, 360P for much fitting with lower-end displays. • It can crop black or blank parts on images; trim unwanted segment off footage; merge several clips into one as well as rotate/flip videos. • It gives advanced editing options to stabilize video, reduce auido noise, fix fisheye, add effects/watermark/subtitles, make gif from GoPro video and extract frame from video. • It allows you to adjust video/audio parameters, like resolution, aspect ratio, bit rate, frame rate etc, for further compression or other purposes.